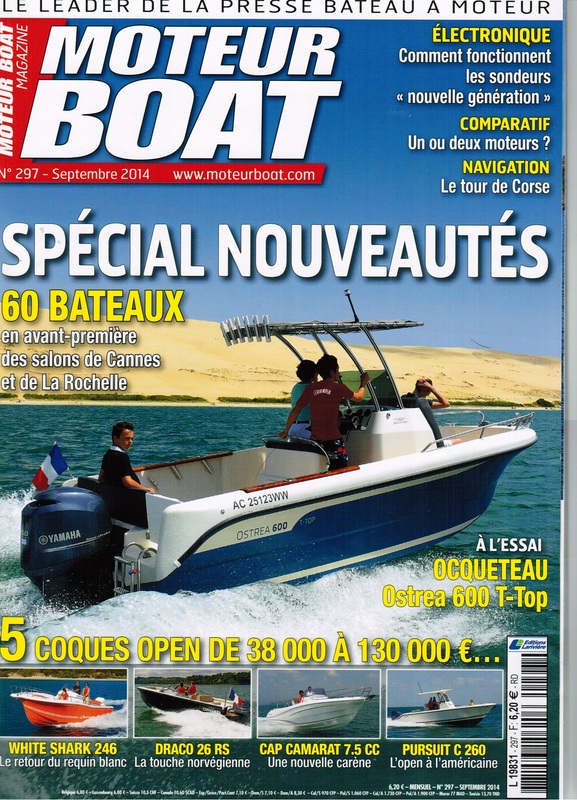 OSTREA 700 has been awarded "Motor Boat of the year" by the french magazine Moteur Boat. UPGRADE YOUR NEXT BOAT ! All prices in the advert are with french VAT. 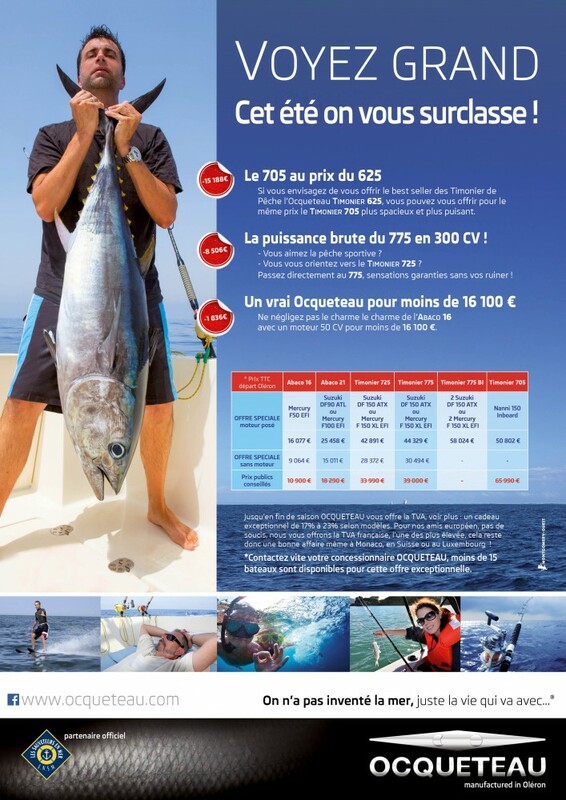 French marine rescue association SNSM represented by its Chairman Xavier de la Gorce and Ocqueteau represented by Christian Monier signed last 19th of march a cooperation agreement. As a first step Ocqueteau's yard has provided saturday 7th of june a Timonier 605 equipeted with a Suzuki DF 90 and patented SNS 452 to SNSM training and operational center at the Treport. Watch out! THE OSTREA 600T-Top arrives! All the teams of the construction site(work) as well as the distribution network are happy and proud to announce you the arrival of the new OSTREA 600 T-Top from the beginning of this summer! Propped up well in the leaning post, numerous arrangements are arranged(treated carefully). T-Top, in stainless tube of 48 and 33 mm and windscreen gone(taken) up on silent blocks protect you from the sun and the bad weather with a devastating look! The 600T-Top is approved until 200CV for an authorized maxi speed of 45-50 knots! Really exciting whatever is the program: pure fishing, day cruiser, ski, Wake. The 600T-Top? A real adventurer(fighter) 4X4 seas, solidly built and assembled in our construction site(work) of Oléron for you by our companions(journeymen). Her price? From 23500 €. 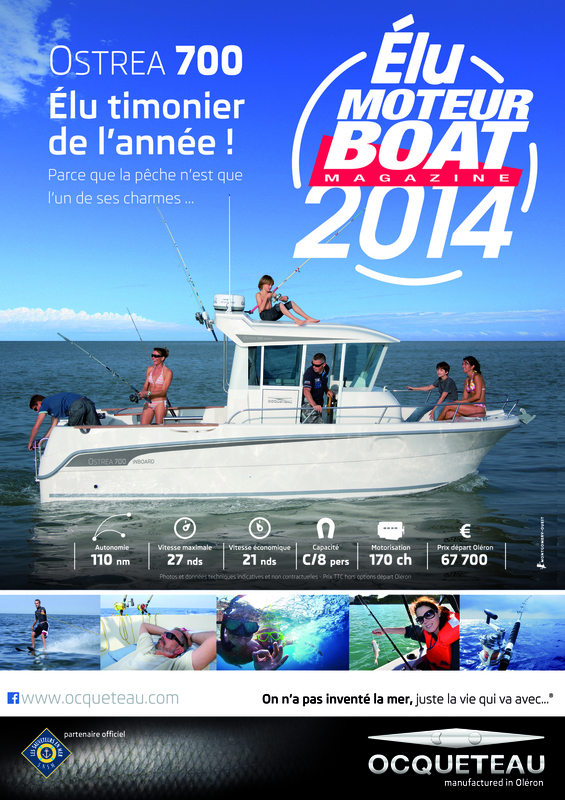 Reserve fast your at your dealer OCQUETEAU, there is only 10 OSTREA 600 available T-Top before the holidays!